When I was in high school, I had a boyfriend whose clothes always smelled good. It wasnt cologne but I couldnt figure out what it was until his mom told me. Fabric softener! Not sheets (like we used at home). So now I go fancy style and buy liquid. Because it lasts longer than 5 minutes after the clothes are removed from the dryer. And it makes my whole house smell good when I do laundry. 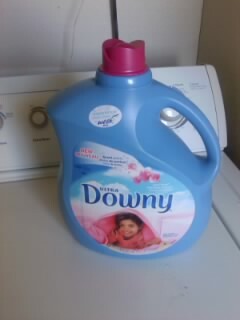 So I totally didn't get the concept of fabric softener until later in life. That you don't need sheets AND liquid. Just one or the other. No one ever told me. I think I had to read the label. My favorite softener is actually the simple pleasures line but I had a coupon and it was on sale (the regular stuff pictured above) and I got it at Target which means it was actually just the regular price at Wal-Mart. But whatever. I love Target. It's worth it. I wish that Downy was paying me for all of this product placement. Or I wish they would at least send me free stuff. Until then, I'll keep buying anyway.